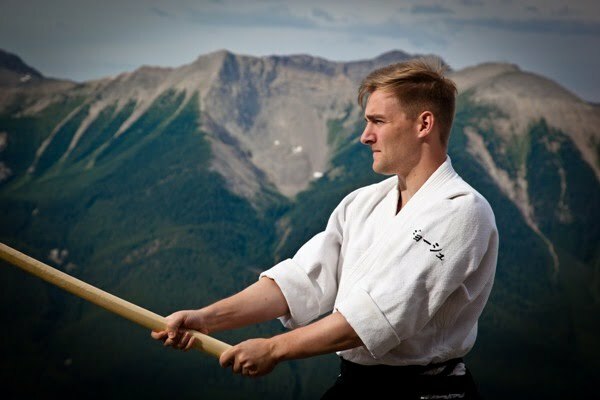 Josh MacDonald has over 20 years of martial arts experience. He obtained his sho-dan (black belt) in Chito Ryu karate in 2000. Sensei MacDonald ("Jo-shu Sensei") received black belts in Aikido, Iaijutsu and Kenjutsu during his time in Japan. 8 years ago, Josh visited the Hombu dojo in Chiba unannounced. He could hardly understand Japanese at that time, but he introduced himself by gestures and asked me, if he could start training He probably looked up the training schedule through his Japanese friends before hand. I said, “Please, have a seat” and gave him a chair. That night, I trained with Mr. M who is a prison guard and a master of traditional bo-jutsu (an art of using a stick as a weapon). The focus was basic technique, which is a feeling of balance, different speed, and sword techniques. Josh sat straight and watched. When I see an observer who doesn't look interested, I often tell them “Please come again, if you’d like” and let them go. But I was sure Josh was very interest in the training. After the training, I asked Josh, “How was it?” “I really would like to try!” he replied. 9th of September 2004: Josh became a disciple of the dojo. He was 23 years old. He trained every Monday night, Thursday morning, Saturday and Sunday night. Sometimes he missed training because of oversleep (especially Thursday morning). It’s a pleasant memory how he used to pass near the window on his bike waving his hand and shout out, “I’m on my way to work!” He was like a younger brother I never had. I allowed him to train in his own way. He became a good training partner. Not only did he have good techniques, he also was a person of good character. I started to show exercises using him as a partner. 31st of June 2006: I recommended him to enter the“Japan Kobudo Promotion Society” (the oldest martial arts society in Japan). He enrolled in the society until 2008, and he took part in martial art events (for example “Demonstration of Japanese Classical Martial Arts”). Following URL is a movie of demonstration in September 2007 at Adachi Tokyo by me and Josh. It is one of the well-known movies in the world, and it shows his excellent abilities. 3rd of June 2006: He was certificated to shodan in “Mugen shinto ryu iai jutsu”. 30th of June 2007: He was certificated to shodan in “Daito ryu” and shodan in “Aikido rakushinkan”. 2008: He went back to Canada. 24 September 2010: We got together again, and had training together for 2 weeks. I am in Japan for a little while. I would like to train with you. Is there class tomorrow at the Hombu dojo? Japanese may see him as a free spirited person. I would like it if Josh came to visit me as a brother someday and reminisce the time we spend together. 11th of October 2010: He was certificated to 2 dan in “Daito ryu”, 2 dan in “Aikido rakushinkan”, 2 dan in “Mugen Shinto ryu iai jutsu”, and shodan in “Aidzu den Ono ha itto ryu ken jutsu”. He has now started Aikido in Canada. Who would have imagined?? I am so proud of him!